Smartphones, despite their name, are actually pretty dumb. They only do what you tell them to, and constantly inputting information can get tedious. However, with a few reminder apps, you can not only make your phone smarter, but turn it into a personal assistant that lets you know of important information about your belongings that you need to carry with yourself. For the same purpose we are also here with a review for an app Don’t Leave it! What is Don't Leave It? Don’t Leave it! is an iOS app that will remind you to bring your item if you walk away from your present location. 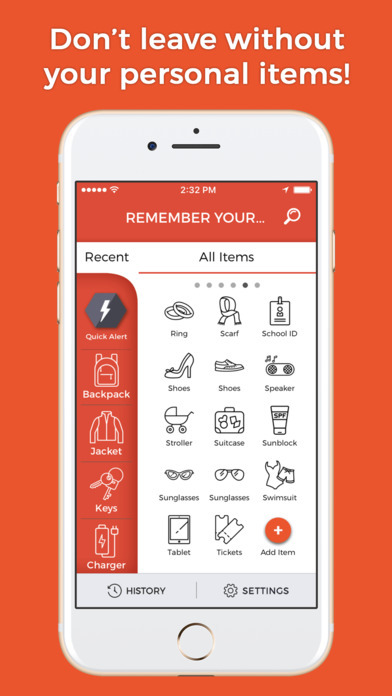 The app is based on reminder functions and it uses GPS of your device to track your location and instantly give you an alert about the item, you set a reminder for what. So no more lost and found of your personnel belonging will happen now again whether it is purse, ID, credit card at the bar! · Set your alert distance let say you can walk away from your belongings, about 60 steps. · Reminds you through push notification when you leave the mentioned distance. · About 80 pre-added most forgotten items. Additionally you can also search the app’s personal item library to quickly find the item you want to create a reminder for. What's great is that it works even if you are run out with your data or if there are no signals. So what you are waiting for? Download today this amazing app free for your iOS device. Click the link below to install and never be worried about your important stuff anymore. App Store Download Link: Don’t Leave it! Remember to take your stuff!